The Royal Château de Plessis-lèz-Tours is the remains of a late Gothic château located in the town of La Riche in the Indre-et-Loire department, in the Loire Valley of France. Around three fourths of the former royal residence were pulled down during the French Revolution in 1796. Plessis-lèz-Tours was the favorite residence of King Louis XI of France, who died there on 30 August 1483. It was also the scene of the 1589 meeting between King Henry III of France and the future King Henry IV of France which resulted in their alliance against the Catholic League. The present building is only a small part of the château originally built by Louis XI in the 15th century. The original château had three wings in the shape of a U. The room where Louis XI died can be visited. It has late 15th-century wooden linenfold panelling. The first floor has paintings and sculpture devoted to St. Francis of Paola, whom Louis XI summoned to live near him until his death. Inside the château is a display of iron cages which were suspended from the ceiling and used to hold prisoners. The cages were so small that the prisoners were unable to stand. The remaining wing, which had long been used as a dairy farm and a buckshot factory, has been listed as a monument historique since 1927 by the French Ministry of Culture. Indre-et-Loire is a department in west-central France named after the Indre River and Loire River. In 2016, it had a population of 606,223. Sometimes referred to as Touraine, the name of the historic region, it nowadays is part of the Centre-Val de Loire region. Its prefecture is Tours and subprefectures are Chinon and Loches. Indre-et-Loire is a touristic destination for its numerous monuments that are part of the Châteaux of the Loire Valley. The Royal Abbey of Our Lady of Fontevraud or Fontevrault was a monastery in the village of Fontevraud-l'Abbaye, near Chinon, in the former French duchy of Anjou. It was founded in 1101 by the itinerant preacher Robert of Arbrissel. The foundation flourished and became the center of a new monastic Order, the Order of Fontevrault. This order was composed of double monasteries, in which the community consisted of both men and women—in separate quarters of the abbey—all of which were subject to the authority of the Abbess of Fontevraud. The Abbey of Fontevraud itself consisted of four separate communities, all completely managed by the same abbess. The Château de Loches is a castle located in the département of Indre-et-Loire in the Loire valley in France; it was constructed in the 9th century. Built some 500 metres (1,600 ft) away from the Indre River, the huge castle, famous mostly for its massive square keep, dominates the town of Loches. The castle was captured by King Philip II of France in 1204. In 1985 it was converted into a museum, and has one of the most extensive collections of medieval armour in France. The Royal Château de Blois is located in the city center of Blois at the Loir-et-Cher département in the Loire Valley, in France. The residence of several French kings, it is also the place where Joan of Arc went in 1429 to be blessed by the Archbishop of Reims before departing with her army to drive the English from Orléans. The Château d'Angers is a castle in the city of Angers in the Loire Valley, in the département of Maine-et-Loire, in France. Founded in the 9th century by the Counts of Anjou, it was expanded to its current size in the 13th century. It is located overhanging the river Maine. It is a listed historical monument since 1875. Now open to the public, the Château d'Angers is home of the Apocalypse Tapestry. 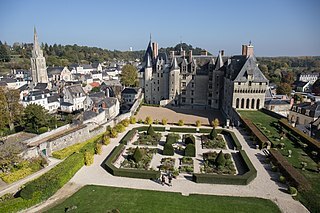 The Château de Montrésor is a medieval castle with a Renaissance mansion built in the grounds, located in the French village of Montrésor in the département of Indre-et-Loire. The Château de Gizeux is an important edifice, dating from the Middle Ages and much altered over the centuries, notably during the Renaissance and the Age of Enlightenment. The Château d'Azay-le-Rideau is located in the town of Azay-le-Rideau in the French département of Indre-et-Loire. Built between 1518 and 1527, this château is considered one of the foremost examples of early French renaissance architecture. Set on an island in the middle of the Indre river, this picturesque château has become one of the most popular of the châteaux of the Loire valley. The Château d'Ancenis is a castle in the town and commune of Ancenis in the Loire-Atlantique département of France. The castle is on the bank of the Loire.